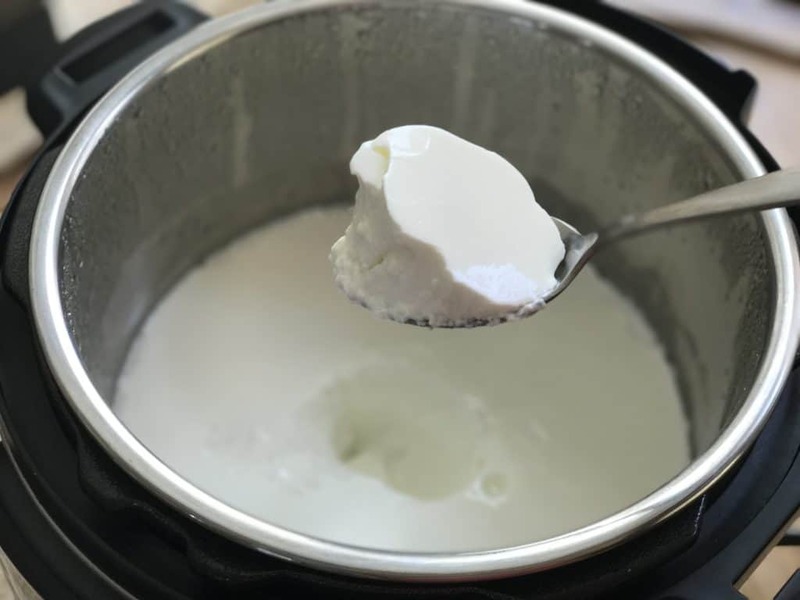 Instant Pot No Boil or Cold Ingredients Yogurt is a quick way to make yogurt using cold milk and cold starter yogurt in the instant pot. We are a heavy yogurt eating family. My husband loves yogurt with every meal. Yes, Indians have yogurt as a side with curry. 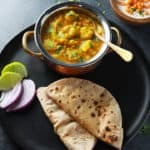 We do need something to neutralize the spicy food 🙂 Yogurt is always a healthy and nutritious choice, you can pretty much have it for any meal – breakfast, lunch, snack or dinner. Making yogurt at home is also very cost effective, and you know that you are feeling the right ingredients to your family. 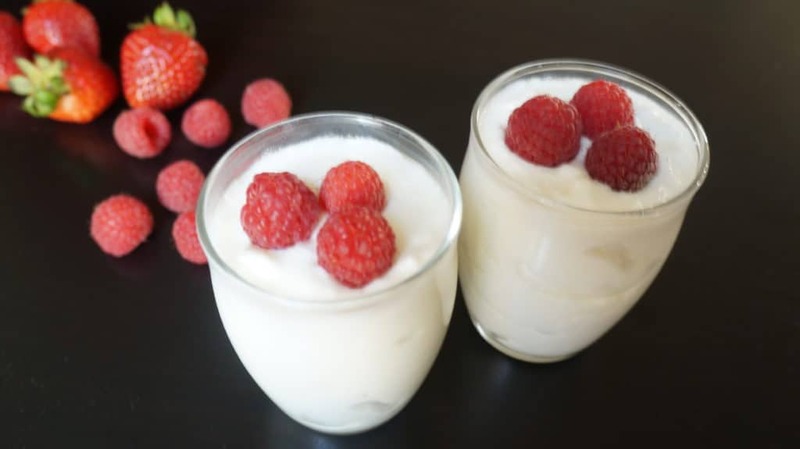 I have shared the traditional recipe for yogurt in the instant pot before. I certainly love the pot-in-pot method to make yogurt so it is set right in the bowl and I can refrigerate it. However the only thing that sometimes stops me from making yogurt in the evening after work is the time it will take for the milk to boil and then cool down to the right temperature. I have been seeing many posts on Facebook Instant Pot group about making yogurt without boiling, so I wanted to try it out. So here is the cold ingredients method where I don’t have to boil and cool down the milk anymore. That said, I do want to mention that you need a special type of milk, ultra-pasteurized, to make this yogurt. And the taste is not exactly the same as yogurt made from normal whole milk. This may not be an issue if you flavor your yogurt, however if you eat plain yogurt you might want to taste this and check for your preference. What is Cold Ingredients Yogurt? The main difference from normal yogurt is that the milk is not boiled and cooled to the right temperature before adding the starter. You skip the boiling step. The cold milk and the starter with live cultures are added to the Instant Pot, and you let the Instant Pot “Yogurt” mode do it’s magic. Another difference from normal yogurt is that this method gives a thicker greek yogurt like texture, so no straining is required. The biggest advantage is method is that it is a “One pot, one shot” technique which certainly saves time. 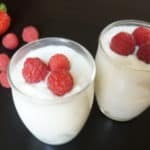 What do you need to make No boil / Cold Ingredients Yogurt? Fairlife Milk has been the popular choice in the USA for most instapotters. The Canada version for this milk is Natrel. These milks are called ultra filtered and are pasteurized at a higher temperature. There is more natural protein and calcium in this milk and less sugar. Fairlife milk is not organic. But Fairlife milk is lactose free, so this is a great option if you are lactose intolerant. You can use other ultra pasteurized milks to make cold ingredients yogurt, however I have not tried with any other milk. Also, note that it is not recommended to use this cold ingredients method with milk that has not been through the ultra pasteurization process. Other than milk, you will need a yogurt with live active cultures to use as a starter. 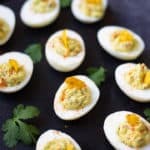 I used Fage yogurt as starter for this recipe, but really any yogurt will work. Just check for live active culture in the ingredients. After you make yogurt the first time, you can save some as a starter for your next batch. Note: I am not advertising Fairlife or Natrel milk and am not related to the company in any way. This milk has been the choice for making this cold ingredients yogurt. 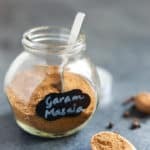 How to make No boil / cold ingredients yogurt? 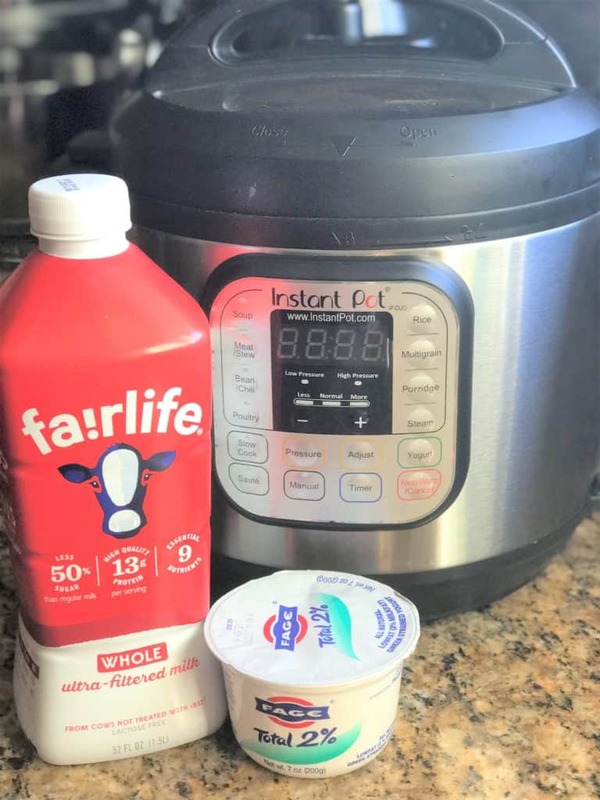 Pour the carton of Fairlife milk into the instant pot insert. Add 2 tbsp of yogurt (I have noticed that with 1 tbsp I have not got the right consistency). Mix the starter well with the milk by using a whisk. If you like to sweeten the yogurt, you can add the sugar or vanilla or condensed milk. Mix it well. Set the Yogurt mode on the instant pot. It should read “Normal” and you can set it for anywhere between 8-10 hours. If you prefer, a glass lid can be used when making yogurt as you are not cooking under pressure. Open the lid after the set time (8-10 hours). The yogurt should have a thick consistency. At this time, you can cover with a silicone lid and cool the yogurt in the fridge. You could also transfer it to a glass container or mason jars and then cool it. You can add your favorite topping to the yogurt or have it as is. My taste test result is that the yogurt is very thick and creamy, but does not have the tang I look for in the yogurt. I am also used to a little less thick yogurt, as that is how the usual homemade yogurt that I grew up eating is. So for my Indian friends, this is not like the homemade yogurt you have known, it is more like greek yogurt. That said, many people prefer greek yogurt and this is certainly a great option! I still prefer my simple yogurt over this no boil yogurt, but if I am crunched on time, this is a great option rather than buying it from the store. I recommend you try both methods and choose the one you prefer. Do share your comments about what you liked and how you flavored your yogurt! 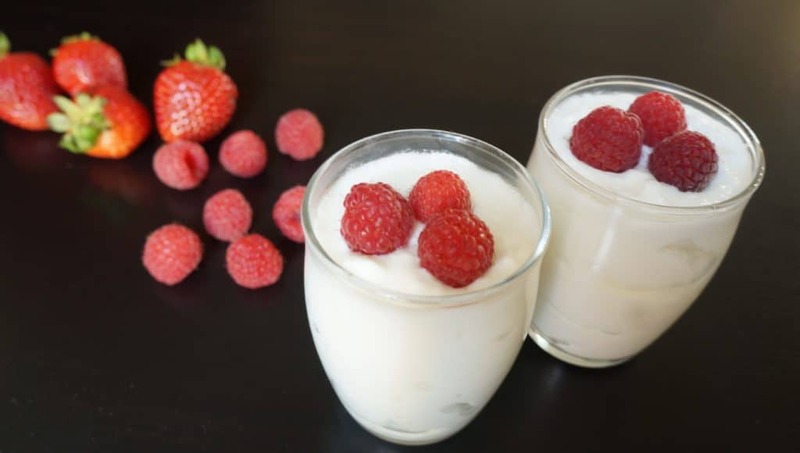 Instant Pot No Boil or Cold Ingredients Yogurt is a quick way to make yogurt using cold milk and cold starter yogurt. Spend less time making the yogurt and more time enjoying it! 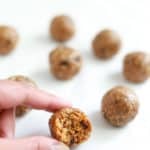 Add milk and yogurt to Instant pot insert. Whisk together so the yogurt mixes evenly with the milk. Place the instant pot lid or a glass lid. Push the Yogurt button and use the +/- buttons and set time to 8 hours. Make sure the Yogurt setting says "Normal". If you prefer tart yogurt, you can increase the time. When yogurt cycle is completed and the instant pot beeps, cover with a lid and refrigerate or transfer to glass jars or container to refrigerate. Enjoy yogurt with your favorite flavor and toppings. 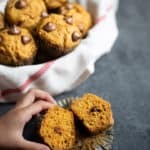 Do not use raw or normal milk for this recipe. It does not set well and also it contains bacteria due to which it must first be heated. If you prefer, you can add sweetened condensed milk or vanilla when mixing the milk and yogurt starter. If I were to put the yogurt into 4 or 5 oz jars, how many would i need for one batch of yogurt? Or what size glass container for the whole instant pot of yogurt! For Nartel in Canada which one should we use?As I am on Canada.